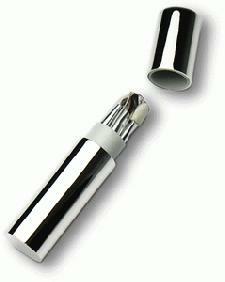 Stunning Nickel Plated Make-up Brush Set in Personalised Holder by Calendar Lady Promotions. This Nickel Plated gift would make a fantastic promotional freebie or giveaway to any prospecting clients, or even as a warm "thank you" for recent custom. The Makeup brush holder can be branded or engraved with a company logo and design, which will stay with the customer and will be used daily... But don't delay, stock moving fast! For a free quote on our Makeup Brush Set please click here for our online enquiry form.